Kitchen Clatter: Don't Let Riverton's Little House "Pass You By"! Tarp gone! 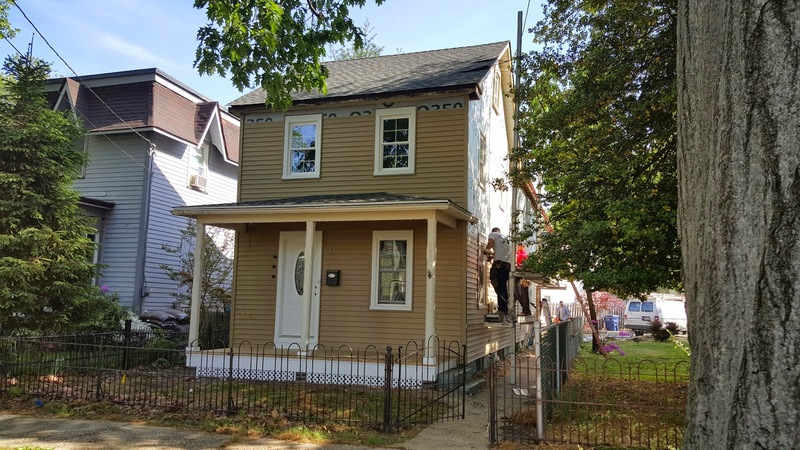 New roof, new windows, new porch! For years it was neglected. Collapsed roof, rotting floors, rusting pipes. Families living in homes nestled along the river, passed it on their way into town for an ice cream cone at Nellie Bly's, or a fresh pastry at the Orange Blossom Cafe. Sadly, without much thought. This decaying structure where spiders, mice and squirrels had claimed a homestead, just couldn't demand the attention of those passing by...until now. 505 Main Street is on its way back. Big time! Blue plastic tarp has been replaced by new rafters and roof. New windows and siding surround the exterior while the interior is undergoing a complete overhaul. Wide planked hardwood flooring has taken hold where old linoleum floors have been removed. Kitchen hardwood floors covered by tarp as drywall goes up! With a tentative early-June completion goal, there is much more to do. It's still a building with a mission, not a home yet. But thanks to the vision of the new owners, it is well on its way! On a recent visit, I discovered how easy it was to step into the newly renovated concept and then take the next step into the past. One thing is for sure. If the kitchen is really the heart of a home, this soon to be gem will have a really big heart! The kitchen will sit center stage with a large island and additional eating area! Stone countertops and stainless steel appliances will add to its upscale function. Overhead beams have been installed to support the newly added master bedroom, en suite and walk-in closet on the upper level, in the rear of the house. Behind the kitchen on the lower level will be a quest bathroom on one side and a laundry room on the other. A new tub sits in preparation of a full second bath upstairs. Researching the design of older homes, it seems that two things were kept in mind; construct houses with lots of rooms and doors. The purpose was to provide large families (in the 1800's the average family size was 7), the ability to acquire an area of "private" space. And also, since fireplaces were initially the main source of heat, doors of rooms not being used could be closed to provide more warmth to those in use. But since we have scaled down the average family size to four or five, tops, along with the development of highly efficient HVAC systems, (the system here has been converted to gas with central air) open concept is the desire of today's home buyers! Contractor/owners Mike Vogel, and Tom and Denise Kilroy, are keeping that in mind. Through ingenuity and foresight, they have taken a two bedroom, one bath dwelling and turned it into a 2.5 bath, 3-bedroom unit which now also includes that aforementioned master suite and first floor accessed laundry room. They have utilized every inch of space in making this place appealing and relevant to the current real estate market. Listed through Betty Shepard of Berkshire Hathaway Realtors, preparations are underway to bring this house to market. "There has been so much interest in this house. So much interest in this historic town! It is exciting to watch the renovations," said Shepard. Original floor and woodwork in living room will be stripped and stained. Beautiful! 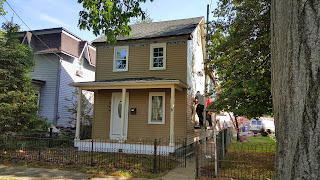 This once little house in Riverton, NJ is about to make someone's dreams come true! Don't let it pass by. It also helps when on a tired day or a lazy Sunday morning.Kitchen Faucet Review One can get its desired snack with no much stress and a pleasant day continues. Dishwashers are awesome for comfort, however it's imperative that you utilize them astutely. Did you realize that a considerable lot of the more up to date, more vitality proficient dishwashers utilize less water than old models? dining room furniture This is also a very good post which I really enjoy reading. It is not everyday that I have the possibility to see something like this. Searching for RTA kitchen cabinet deals? Head over to the CabinetApp- Online Kitchen Cabinets. This is a well-renowned online store presenting the best quality ready to install cabinets, organizers, doors, drawer boxes for sale. The product prices are pocket-friendly. Get yourself registered now and add your desired products to cart for buying.